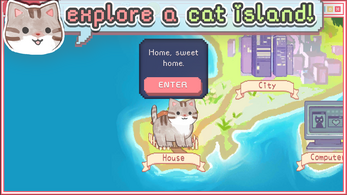 ♡ (＾·ω·＾) ﾉ Befriend and collect cute cats as you explore an island of wholesome kitties! ♡ Made by me, Angela He. Thanks to Cityfires for the music. Check out the Wholesome Cats Github and my Facebook/Tumblr/Twitter! *Want to play game on another device? Click the person icon on bottom right, create an account, logout of account, then login to account on your other device. It's super frustrating I can't create an account and log into it. I would continue the game if you fix this bug please. we have a weekly feature on our podcast called date nite, in which my partner and i play video games together. we had a tremendous time with this game and enjoyed it a lot! playing other games from you angela in the future. It also won't let me make an account. It says my verification link was wrong. 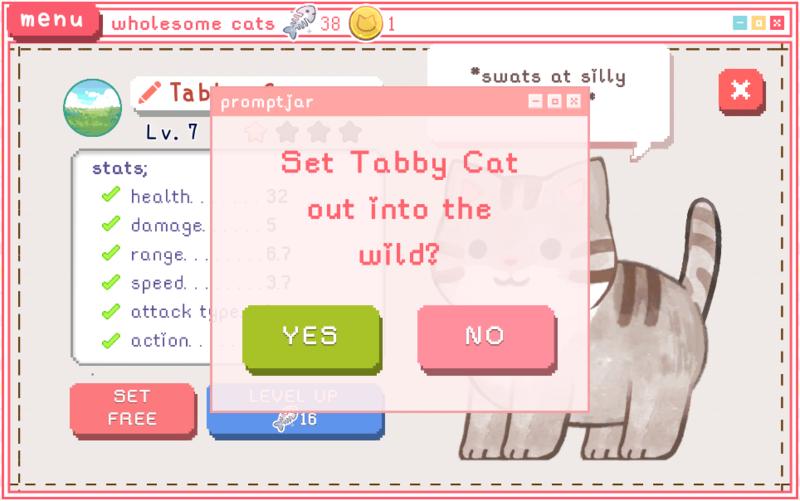 I think that's bc if all your slots are full you don't have the capacity to get another cat. you can buy more slots with coins! I haven’t played the game but I’m sure it’s gonna be a wonderful game because of all the comments!! this game is soo amazing i was playing for hours and hours! so I made an acount but when I put my email in and password it just says login fail. permission denied try again can someone help me? 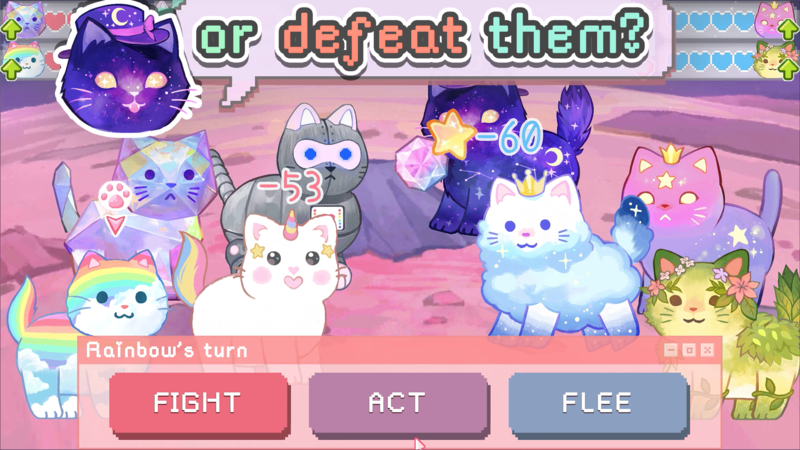 I'm on my laptop (as many of you are) but I cant see the cursor when I go into the game :( so when I fight cats it takes me 2 minutes just to find a cat and click on it, and most of the time I click the wrong cat.. how do I play without seeing the cursor? I'm seriously about to show this to my little sister she loves cats. This is so cute <3 I sadly seemed to have run into a bug and can't continue, but I really enjoyed what I played. its for if you dont want them or if there just too weak that they take the place for better cats. It just feels sad, but I know the reason and function ~ In Life, we're really gonna go through these things. so, I'm not sure if this is my macbook's problem, but the game doesn't let me have a cat? like, the first try when the bread cat gives me a coin, I do what I'm told, and the paper thing comes out and disappears suddenly. This game is adorable! While the battle system can be a little jarring at times I still enjoy the game through and through. 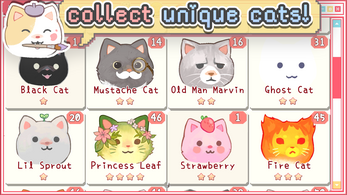 Other people: Do you know how I can get cat coins? I know there's a rare chance one of your cats can give you one or you can sell one of your rare cats for it, but I wanna know if there's more! i've got a question, what do i call myself if i play your game? i mean, a person who uses scratch is called a scratcher, a person who plays minecraft is a minecrafter. what do i call myself? for now i'm calling myself wholesome catter, but i don't know what i should really be calling myself. I don't know why, but sometimes on desktop, the battles get hung up and you just have to wait 5 minutes for the cat to fire. This was a pleasant surprise! Although the mobile version is far superior, it works nearly as well on PC! The only issues are with the store (which works perfectly on mobile.) It's super cute and a nice time-waster. The dev has got some real talent! I really hope you don't mind but I had to play this game and make a video over it. It was just way to wholesome to pass up. 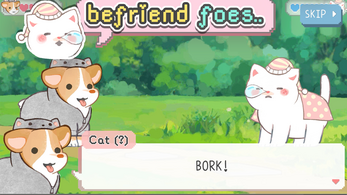 I couldn't resist the urge to boop and hug my way through this game. The art, the animation, and the music just melt my heart. This game is just to cute 10/10 would love and care for these kittens.